I had a weekend away and for only the second time I didn’t bring my thermo-baby with me…! Consequently I suffered major thermomix withdrawal all long weekend, so I had to make up for it today. Want the recipe? Check the recipe tab! 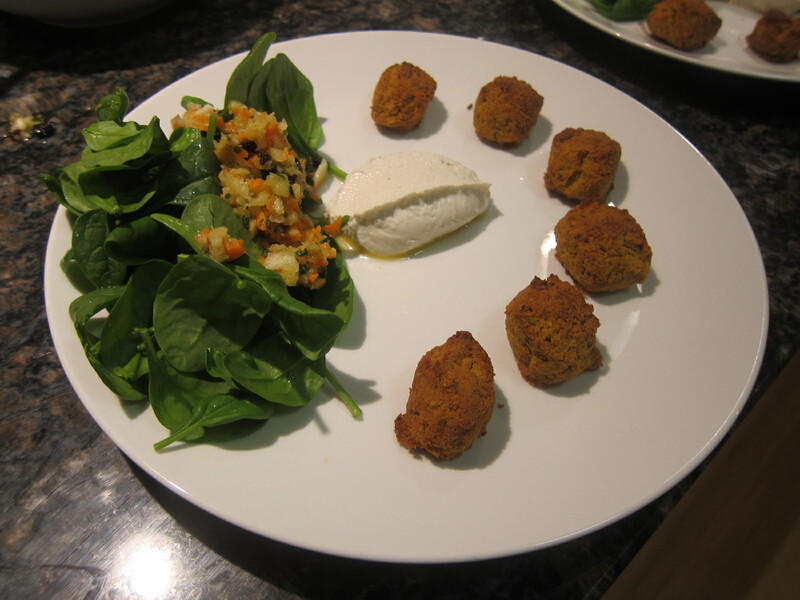 I made the falafel mix this morning about 9.30 and used tinned chickpeas. I rolled them into balls almost straight away and left them to dry out on the bench for the rest of the day – which they really needed. I’m not sure if it was the tinned chick pea factor, but it made a fairly wet mixture – and I did over process it, while I was trying to cut down some chinks of carrot that I couldn’t get rid of. I’ve discovered a trick though – rather than cutting the carrots into chunks, if you cut the carrot in half length ways, and then cut into chunks, it makes for a much more even grate. 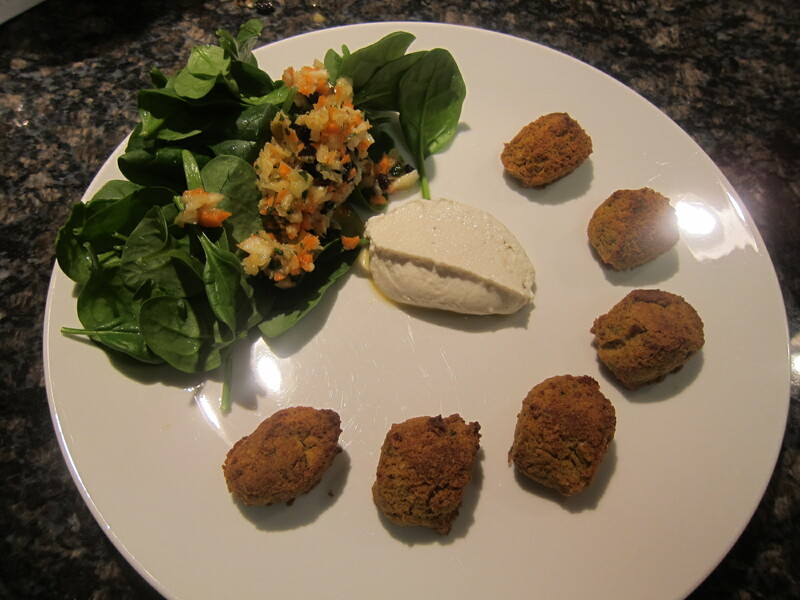 I fried them falafel just before my son was due to have his dinner at 5pm, but they were still a little wet and not crunchy, so I popped them in the oven at about 100 degrees for about an hour. By the time I got to my dinner, they were beautifully crisp and a lovely toasted brown. I’m wondering if Master 3 might eat them tomorrow – – – I’ll keep my fingers crossed! I’m a bit of a salad dogder, well – actually, more a fruit dodger to be honest, and the thought of fruit of any description in a salad usually turns me right off, but I was brave and tried the salad with both the pear and the currant. It was absolutely beautiful, lovely and sweet, but with the tang of fennel also. I had let it sit in the fridge for an hour or so and I don’t think it did it any harm at all. 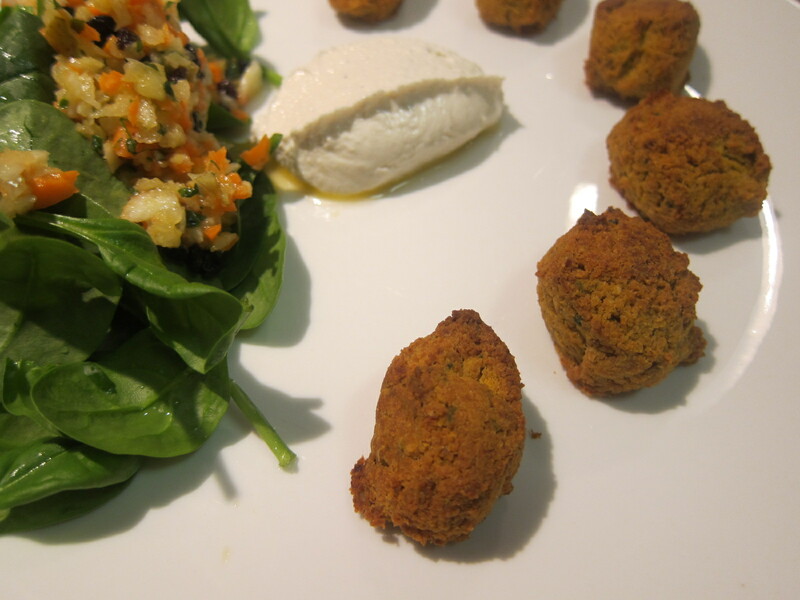 The tahini dressing is gorgeous, almost mousey in it’s consistency. I made the dressing about midday and kept it in the fridge, so it’s a good one to prepare earlier. I still have quite a bit left, so I’ll see what I can use it on over the coming day or so. When you scrape down the bowl after blitzing the sesame seeds, make sure you scrape the bottom of the bowl as well, especially around the edges, as when I’d mixed it in and then poured it out, I found a few bits of sesame paste that hadn’t incorporated properly. All in all, this is a really satisfying dish, which tastes great. Next time I’ll try with dried chickpeas and soak them for 8 hours before I make it – and see if that helps the crisp factor. These would be a great prepare ahead snack for a drinks party, too.